An interactive information kiosk is setup in the Chinese style wall for visitors to check more information about the exhibition. Different from the traditional way of information kiosk, it is a touch-based kiosk with fast response software running in an Android device connecting to a big TV screen. The software is tailor-made based on the exhibition information. 6 points of touch sensing panel are installed on top of the TV screen to enable to touch control. Our team is pleased to participate in the design and development of some interactive exhibits in this exhibition. This exhibit is a big digital book and it is easier to attract and arouse people’s interest. User can select different contents or turn pages by simply touching the screen. 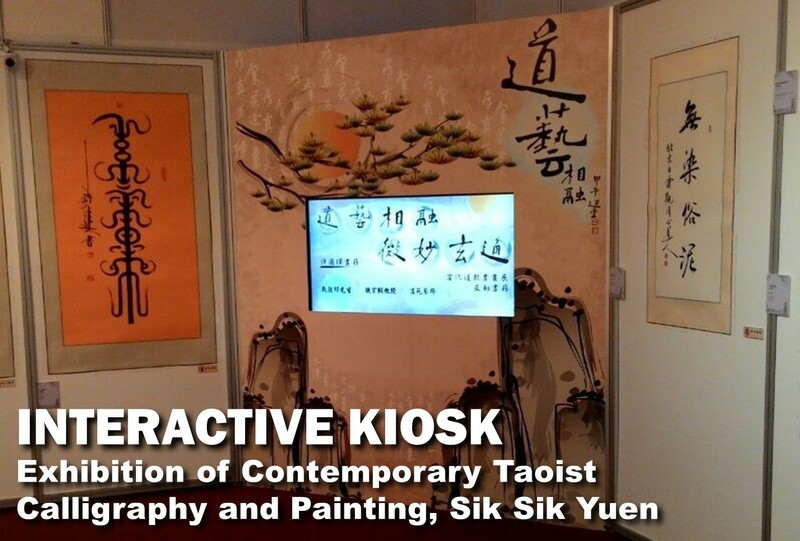 In order to celebrate the 65th Anniversary of the Founding of the People’s Republic of China, Exhibition of Contemporary Taoist Calligraphy and Painting is organized by Sik Sik Yuen at Sik Sik Yuen Wong Tai Sin Temple Fung Ming Hall from 16 Sep to 17 Oct 2014. Different art will be displayed and there are several interactive exhibits in this exhibition. Also, it is the first time that Sik Sik Yuen uses interactive projection and 3D painting in their exhibition.